Osona is a region situated between the Pyrenean foothills and the coastal mountain ranges Vic is the capital city. Covering an area of 1,260 km² and with a population of 155,069, it is made up of fifty-one municipalities (1). Osona’s climate is that of a humid continental Mediterranean region, with regular and abundant rainfall in the north and east of the region throughout the year. Summers are hot and winters cold, with high possibilities of frosts. (2) Due to the humidity of the eastern mountains holm oak, oak and beech woods are the principal vegetation. The current demarcation of Osona (a part of what was the old county of Osona) is a result of the 1936 territorial division and does not correspond with any specific historical division. The pass of history in this territory can be felt in its museums and monuments: from Iberian and Roman settlements through to the Romanesque art of its monasteries, industrial architecture of great value and a first class literary heritage. Its natural, architectural, literary, artistic and industrial heritage is breathed in in every corner of the region. 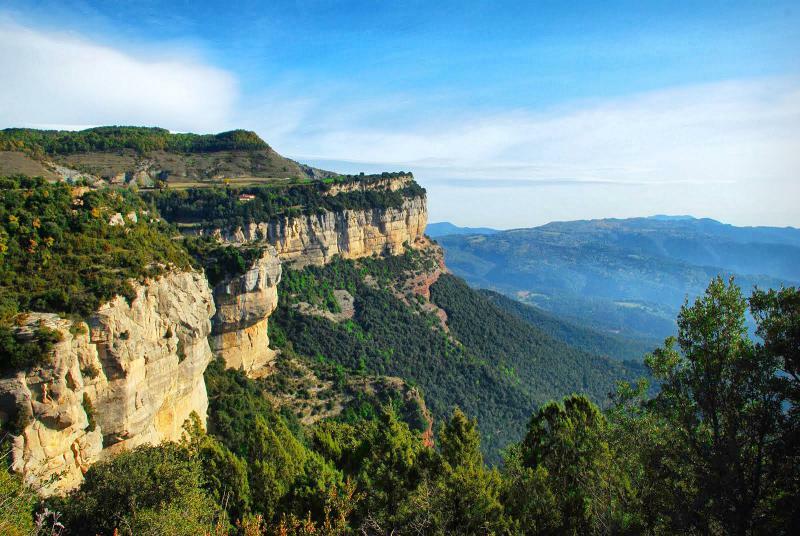 Osona is a space rich in natural resources, and the mountains which span the whole territory form part of the characteristic scenery of the region. Locations such as the Guilleries, Collsacabra, Savassona, Gesbisaura... or the immense natural parks offer activities to be enjoyed all year long. Located in the southern part of the region it is the highest massif of the Catalan Coastal Mountain Range. It is of noted natural and cultural interest, not only because of its great biodiversity but also because of the impact it has had on the work of artists and intellectuals throughout the ages. The Bisaura, made up of the municipalities of Montesquiu, Sant Quirze de Besora, Santa Maria de Besora, Sora and Vidrà, is a place of incomparable scenic beauty. Pine, oak and beech woods surround the castle, a 10th century fortified country house which is worth a visit. Surrounding the Sau reservoir and the Vilanova valley this space is made up of 8,370 hectares populated by wooded zones, meadows and cliffs of great chromatic beauty. The expansion of the Romanesque through the different territories of the region is one of its best kept secrets. More than ninety monuments influenced (totally or partly) by the art of this period –especially from the 11th to the 13th centuries can be discovered through ten thematic routes with the Romanesque as its central concept. One of Catalonia’s most important ensembles of industrial heritage is found in Osona, always connected to the River Ter, the principal centre of hydraulic exploitation in the area since the 19th century. The Ter de Manlleu Museum (along with the Turnery of the Vall de Ges Museum) shows and spreads the historic value of canals, factories and textile colonies, easily identifiable through an agreeable walk along the banks of the Ter. The land of Osona is a land of artists. Two figures of capital importance in Catalan modern and contemporary literature stand out: Jacint Verdaguer (1845-1902) and Miquel Martí i Pol (1929-2003), around whom thematic routes have been created, inseparably linking poetry and the territory. The historical centre of Osona’s capital allows one to penetrate into different historical periods: medieval buildings, a 2nd century Roman temple, the Romanesque, gothic, baroque and neo-classical cathedral, the walls and various modernist buildings are worthy of admiration. This charming village, perfect to lose oneself among its narrow, stone-paved streets, is located practically inside the Montseny Natural Park, at the peak of a knoll 840 metres high. The streets of the historical centre of Rupit soak the visitor in the passage of time and history which one breathes in, particularly its medieval past, but also through captivating stone houses of the 16th and 17th centuries. Nature and culture are inseparable in the essence of Osona, and this directly influences the benefits one can get from a visit to the region. One must not forget the bicycle, which is an unbeatable way to discover the territory: with signposted circuits one can take part in races like the Cabrerès-BTT or the Lluçanès-Feréstec, or simply enjoy the two wheels calmly taking your own time. The geographical richness of the region can be appreciated from every perspective: flying in a hot air balloon, through orientation circuits or the via ferrata, by horse, on foot, in a 4x4 or even a Segway. But also with activities to let yourself go such as go-karting, rock climbing, zip-lines, bungee jumping, or with more relaxed activities: golf, bathing at a spa or fishing. Weekly markets, where you can find all types of products, take place in all the region’s towns. And an extensive range of themed fairs, with culture and cuisine as protagonists, also take up many weekends each year: The Mercat de la Música Viva (Live Music Market), Mercat Medieval or the Easter Mercat del Ram in Vic, the Fira de l’Avet (Fir Tree Fair) in Espinelves, or the Festival de Cinema de Muntanya (Mountain Cinema Fair) in Torrelló are a small sample. Cold meats and other pork products are the kings of cuisine in Osona. Longaniza and butifarra from Vic, bisbe, somalla, fuet, baiona cured sausages... all accompany other artisan products such as cheeses, patisserie or beer. Without forgetting the most appreciated products provided by nature: mushrooms and truffles.